In the past, you would have to risk clothing and the carpets around the changing table to take in that fresh baby powder scent. Now you can just mist a couple sprays of Chemical Guys Stay Fresh Baby Powder Scent to enjoy the refreshing talcum powder smell without any of the mess! Everyone loves that new baby smell, but not everyone wants to deal with all the crying and sleep deprivation that comes with raising their own. That 's why Chemical Guys came up with Stay Fresh Baby Powder Scent: just the good smell with none of the stress! 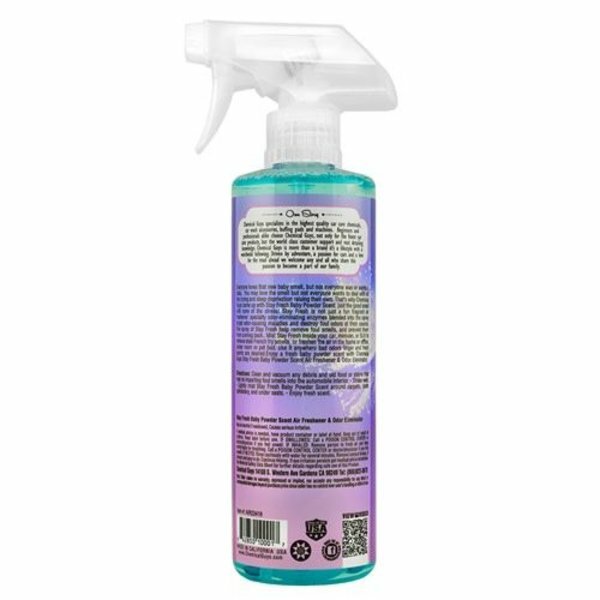 Stay Fresh is not just a fun fragrant air freshener: specialty odor-eliminating enzymes blended into the spray target odor-causing maladies and destroy foul odors at their source. One spray of Stay Fresh can remove foul smells, and prevent them from coming back to any enclosed space. Mist Stay Fresh inside your car, minivan, or SUV to remove stale French fry smells, or freshen the air in the home or office, locker room or pet bed. Use it anywhere bad odors linger and fresh scents are desired. You can even purge stale, musty mildewy smells from automobile air conditioning systems to restore a fresh clean scent, even after the subtle baby powder perfume fades into the ether. It may cost upwards of $250,000 to raise a child born today, but you can enjoy a fresh baby powder scent for just a few bucks thanks to Chemical Guys Stay Fresh Baby Powder Scent Air Freshener & Odor Eliminator. Chemical Guys Stay Fresh Baby Powder Scent Air Freshener captures some of the best parts of raising a baby. A light dusting of baby powder always seals the deal at the end of a successful changing when chaos turns to order, and all is right with the world. New parents quickly learn to savor those few glorious moments of a fresh, clean, dry baby before it all goes to pot, because in between the chaotic moments of screaming, crying, wetting, and puking, there 's all the laughter and smiles wrapped in a fresh onesie and dry diaper. Chemical Guys Stay Fresh Baby Powder Scent purges foul smells and stale air from any car, truck, minivan, SUV, RV, home, office, or other shared space with just 2 sprays. Treat any place with a fresh clean scent and enjoy a moment of calm before the storm with Stay Fresh Baby Powder Scent. Chemical Guys formulated Stay Fresh Baby Powder Scent Air Freshener with active odor eliminators and neutralizers to rapidly subdue undesirable smells right at the source. Baby Powder Scent pleases the senses with the fresh scent of cleanliness and fresh air. Stay Fresh Baby Powder Air Freshener & Odor Eliminator is enriched with talcum powder overtones, delivering a fresh scent that lasts weeks, not days. One spray is all you need for a full size vehicle. Enjoy the fresh and clean scent of talcum powder without any of the mess or responsibility, thanks to Chemical Guys Stay Fresh Baby Powder Scent Air Freshener & Odor Eliminator. Stay Fresh Baby Powder Scented Premium Air Freshener and Odor Eliminator is available in 4 ounce size.